Check Out How Cool ‘The Wonder Years’ Dvd Set Is!! We’ve reported before that the hit television series ‘The Wonder Years’ will finally be released this Fall on DVD, which marks the first time ever this entire series will have found its way to home-video. Not only will be get all 115 episodes, but there will be over 15 hours of bonus material to go along with it. This is going to be the DVD set of the century. We already know that all of the original music will be included in the show, which if you have been watching a few episodes here and there on Netflix, you’ll notice some of the music including the iconic opening song (‘With A Little Help From My Friends‘ by Joe Cocker) is in fact not that version, but another one. But rest assured, the DVD version with have the Cocker song in its full glory. Over the past few weeks, we’ve seen some of the actors from the show post videos and images of their reunion for the DVD release. Needless to say, it’s going to be quite entertaining to see everybody together again, discussing their time making one of the best television shows of all time. You can see some of the images below. But now, the studio is releasing a Limited Edition Set that comes in the form of Kevin’s school locker, which will be metal. Not only will you receive all 115 episodes and bonus features, but you’ll receive a yearbook with signatures from the cast, production photos, and memorabilia including magnets, notebooks that detail every episode, and more. I’m not sure why they haven’t announced a Blu-Ray version yet, since this is in fact 2014, but I’ll take what I can get. And fortunately for us, this DVD will look far better than the so-so image quality that is available on Netflix right now. But this set reminds me of the AWESOME ‘Seinfeld’ refrigerator DVD box set that housed every episode, bonus feature, booklets, and memorabilia too. If it’s anything like that, this will be one spectacular release. 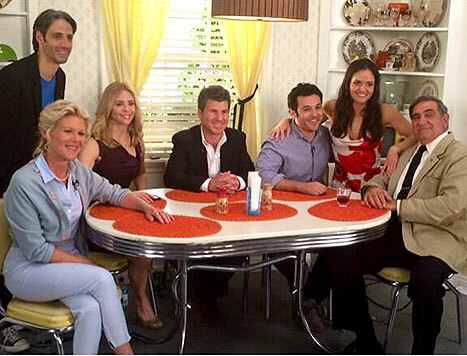 ‘The Wonder Years‘ starred Fred Savage, Danica McKellar, Dan Lauria, Alley Mills, Jason Hervey, Olivia d’Abo, Josh Saviano and Daniel Stern. CLICK HERE TO KEEP YOURSELF POSTED AND ORDER YOU DVD SET!! ‘The Wonder Years’ Is Finally Coming to DVD!!! ‘The Wonder Years’ Coming Back As Miniseries for Netflix! ‘Lego Star Wars: The Freemaker Adventures: Season 2’ Releases To DVD!!! This entry was posted on Wednesday, June 11th, 2014 at 4:54 pm	and is filed under News, Television. You can follow any responses to this entry through the RSS 2.0 feed. You can skip to the end and leave a response. Pinging is currently not allowed. « Enjoy the Trailer for ‘Sin City: A Dame To Kill For’!! Don't be alarmed, we're taking over the ship. [lunges with his sword] AYE! AVAST!